In this VIS image, taken by the NASA - Mars Odyssey Orbiter on December, 14h, 2015, and during its 62.101st orbit around the Red Planet, we can see a very small portion of the Martian Outflow Channel System known as Kasei Valles. There are several Streamlined Islands near the upper center of the frame. The wider part of the Islands are to the left (Sx) while the narrowing of their 'tails' is to the right (Dx), thus indicating that the flow of the liquid (most likely Water) that formed these aforementioned Islands ran, eons ago, from West to East. These Surface Features are all located near the Region where the Kasei Valles Outflow Channels System empties into the Martian Region known as Chryse Planitia. 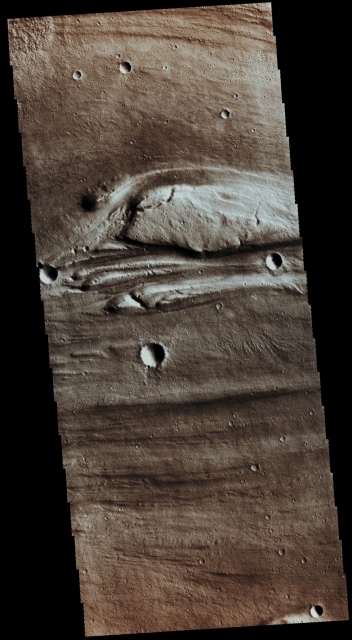 This image (which is an Original Mars Odyssey Orbiter b/w and Map-Projected frame published on the NASA - Planetary Photojournal with the ID n. PIA 20258) has been additionally processed, magnified to aid the visibility of the details, extra-contrast enhanced and sharpened, Gamma corrected and then colorized in Absolute Natural Colors (such as the colors that a normal human eye would actually perceive if someone were onboard the NASA - Mars Odyssey Orbiter and then looked down, towards the Surface of Mars), by using an original technique created - and, in time, dramatically improved - by the Lunar Explorer Italia Team.